Here is the card that I made for him. It takes you to a happy place, don't you think? 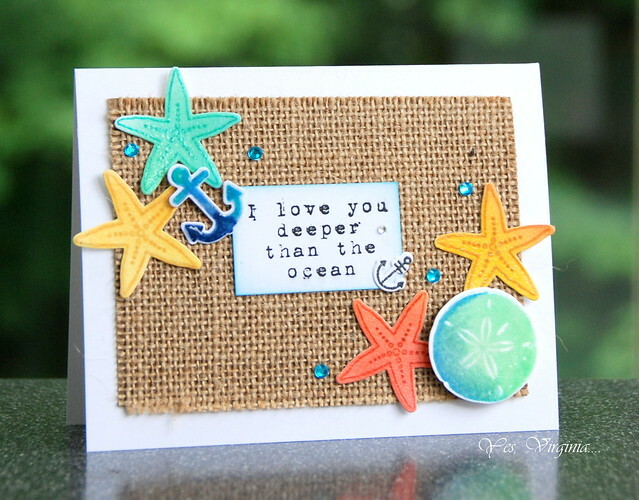 The burlap from DCWV provides an excellent backdrop for all things from the sea. The seashells were made with the Direct to Paper technique. That is, ink up the white card stock ( I used distress ink applicator), then stamp, then make the die cut. This photo might help you see the process. You might ask....why do this? This way all the colors will BLEND and MATCH to your heart's desire. After I had done all that, I clear-embossed the pieces 3-4 times. This process helps to add extra shine and makes the elements thicker. It's like creating your own chipboard embellishments. And speaking of embellishments, did you know that the latest Virginia's View Challenge is calling for "All Things Embellished"? Check out the details here if you'd like to play! I also added blue distress ink around the sentiment so that it will not be lost in all the elements surrounding it. I added the teal gemstones to highlight the colors. Can you tell 31 years just went by? PS: Thanks for the blog love from yesterday's post. It will take me a while before I make another You Tube video again. Your positive feedback and encouragement are always appreciated. Love the burlap on the card. Congrats! Our 30th is next summer. Happy Anniversary. Delightful card Virginia. Does time fly by. Happy anniversary to a wonderful couple!! Virginia, you have made an incredible card for your husband! I like it and I love the tip you shared with us!!! Have a fabulous day and Congratulations!!! I love the beautiful card. It is always nice to view your cards as I get some extras- your family, birds, just nice to see things! Happy Anniversary to you both! The card definitely suits the amazing, "beach-y" weather we've been having here around the GTA lately (except for last night's much needed rain/thunderstorms!) - your card is lovely, Virginia! Best wishes to you & Dr. John on this wonderful milestone - may you celebrate many, many more in happiness & good health. aww what a sweet post.. Happy Anniversary.. yay for 29 years..
Hi, Virginia! First, I want to wish you and Dr. John a Happy Anniversary and many more to come! Your card looks amazing with the burlap! Love all the sweet details, too! Congratulations on 29 years! That is fabulous. You card is beautiful and I love thing about and that sentiment is so perfect. What a a great mile stone to celebrate. Happy Anniversary, Virginia and John! Just love seeing your photos and what a great card for Dr. John, Virginia! 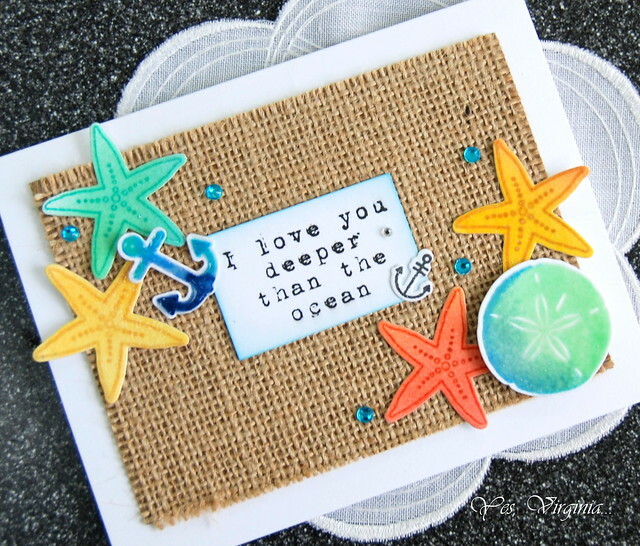 Those colorful starfish are perfect with that great sentiment!! SWEETNESS! Love the texture on your card..HAPPY Anniversary! Happy Anniversary! That is a beautiful card with a very sweet sentiment! Dr. John is very lucky! And I think the two of you haven't changed much! awwwwwww....love the pics! You guys haven't aged a bit! Your card is awesome, I'm always smitten with nautical designs. Congrats to your wedding anniversary! You've given such a beautiful card to Dr. John. Bet he loves you for all you do. Hope to still create handmade cards for my hubby in 18 years myself. 29 years...oh, how they fly by...and, personally, you and Dr. John have weathered those years incredibly well. From the '84 photo, I don't see much difference. Still a very lovely couple. So, belated Happy Anniversary. This is my anniversary month, as well. August must be the lucky month. Who knew? Anyway, Dr. John's card is very beachy and tropical looking. Makes me want to be near the sea. Love that burlap texture a lot. Reminds me of sun, sand and tiki torches. Happy Anniversary Virginia!! You both look amazing! Such a beautiful couple! It doesn't look like either one of you have aged much at all! Must be happy living! Love the card and I agree that you should frame it! It does put one in a happy place! Happy Anniversary! Hiya Virginia, Firstly - THANK YOU so much for the kind and lovely words you left on my blog. They made me feel warm and fuzzy and grin all over the place. Secondly, you know how much I love texture and this card DELIVERS. It is so sweet and sentiment. 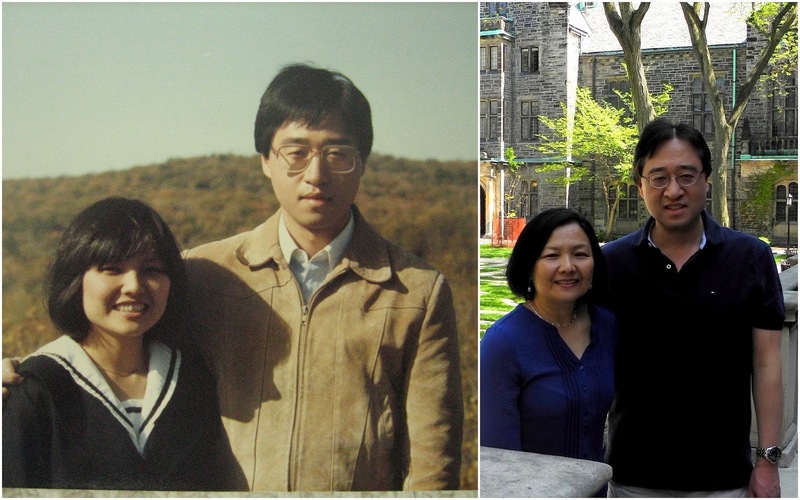 Congratulations on the years of wedded bliss - you guys don't look like you've aged a bit! Wonderful card! And Happy Anniversary...........all the years married is a hard thing to find in this day and age. Bless you both and may you have many more years together. Happy Anniversary to you both Virginia!! Very sweet card and you still look great! Especially that bright smile of yours, hasn't change a bit!!! Aging together and so gracefully is a privilege and sometimes a skill ;) so double BRAVO! I love your card for its composition, texture, color and them, it's a winner and so perfect for Dr John! Virginia and Dr. John ,Wishing You A Very Happy Anniversary. I love seeing the picture from 29 years ago alongside the one just taken. To me,you are a perfect example of how couples should always treat each other,kindness,respect, and a touch of humor added. May you have many happy years ahead to add on to the 29 you have been blessed with. Virginia, I love the Beach card you made for him. It is so colorful.The burlap adds a nice rustic touch. I thought you did a wonderful job with your videos. I could follow and understand each step. You are a very good teacher. don't worry about the people posted negative remarks. sometimes people do that because they have something going on that bothers them. we love you. Happy Anniversary, Virginia and John! Twenty-nine years is impressive - and the love you have for one another clearly shows in both your photos. Wishing you many more anniversaries to come! And Virginia - you are not old! I, on the other hand, am! My husband and I will be celebrating our 4th Anniversary later this month, and I married him when I was 51! Yes, an 'old' bride, but as the saying goes "Good things come to those who wait"! My husband was well worth that wait! Your card: LOVE it! Happy Anniversary! I love the burlap, what a great texture! And great photos! Stephanie looks so much like you! Just back from vacation and playing catch up!! Lots of fabulousness here while I was away. Love the texture on this card. Happy Anniversary wishes to you and Dr. John!! Happy Anniversary! I love your card!